PawnUp.com, the full-scale Canadian pawn shop online reveals some business statistics based on their latest semi-annual performance data analysis. PawnUp.com’s Evaluation Team always aims to offer their customers the highest possible loan amount (or price for sale) for their valuables. Being at the forefront of the online pawn shop industry since its launch in the middle of 2011, PawnUp.com has been accepting a wide range of valuables either for purchase or for collateral for secured loans. Almost every month PawnUp.com has been extending the list of the items they accept, and, today, they revealed some facts about the types of items that their customers are using most often for a pawn loan or to simply sell. The list of items that PawnUp.com’s customers use (and usually get the most money for) is topped with luxury watches. Next on the list is jewelry: gold and platinum diamond engagement rings lead the way, followed by bracelets and chains. When it comes to jewelry, the quality and weight of the precious metal and the stone(s) plays the most important role in determining the most accurate evaluation. Same rule is applied to gold coins, precious stones and precious metal bars. PawnUp.com’s Evaluation Team always aims to offer their customers the highest possible loan amount (or price for sale) for their valuables, based on the items current market value. With the ability to get cash without even leaving their homes, getting the best value for their items has helped many PawnUp.com customers to overcome their financial problems quickly and discretely. 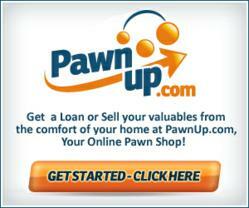 PawnUp.com is the leading online pawn shop in Canada. It offers one of the lowest interest rates (up to 5%), exceptional customer service, fast, free evaluations, free shipping of items, complete security and confidentiality.